When Microsoft announced the death of OneCare, I had a pretty good suspicion that wasn't the last we'd heard from Microsoft about anti-virus software. Microsoft doesn't just suddenly, for no reason, drop out of markets. Rather they stay at it until three or four versions down the road when they finally get it right. With OneCare canceled (a pretty decent product, I thought), the most likely move would be to give it, or some form of the anti-malware software, away. 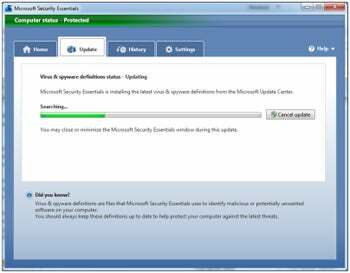 That's how we got Microsoft Security Essentials available for free, (later) today. From my viewpoint, Microsoft Security Essentials got it exactly right. No frills and a minimum performance impact on your system. MSE may not be the fastest scanner of the AV products, but it has a pretty small footprint on your system. Where OneCare, Symantec, McAfee and most other AV products got in the way while scanning, Microsoft Security Essentials has been pretty unnoticeable. And the reviews have shown it does just as good a job at catching malware you don't want on your computer. "When put against AV-Test's "WildList" collection of 3,194 recent, common viruses, bots, and worms, Microsoft Security Essentials detected and removed each and every one of the malware samples. How does this compare to other security products? AV-Test coordinator Andreas Marx notes that "several other [antivirus] scanners are still not able to detect and kill all of these critters yet." In addition, Microsoft Security Essentials put up a perfect score with zero false positives--it didn't flag a single clean file as being malicious. AV-Test also took an initial look at Microsoft Security Essentials' rootkit detection, testing it against a few rootkit samples, and found "nothing to complain about." I've always said the two biggest pieces of bloatware software are Outlook and iTunes. Third is most definitely all those heavy weight anti-virus products. I don't want your goofy firewall. The Windows firewall if just fine, thank you. I don't want your backup software. Got that covered. I don't want your parental controls, nor your browser plug-in, your annoying scanning software or any of that other bloatware that just overloads Windows systems. A simple, straight forward anti-virus scanner and malware protection software tool is just fine. Skip the goo, and stick with the essentials. And why pay $49 a year for AV software while you're at it. It should be protection built into (or that comes with) the operating system. Even Mac OS X's Snow Leopard now has a built in malware engine. An if you want those other features, well, that's what enterprise security suites are for. Or you may just find that the builtin browser malware protection, Windows firewall and other available software does just find without using bloated retail anti-virus software. Thank you Microsoft for getting it right. For small businesses, individual and home users, Microsoft Security Essentials is plenty. Enterprise security suites, like Microsoft Forefront and those from McAfee and Symantec, make sense in those settings. Microsoft Security Essentials is just fine for everything else. The free Microsoft Security Essentials will be available for download later today. Goodbye to all those now unneeded $49 subscription anti-virus products. Your free ride has come to an end. Hello, free Microsoft Security Essentials. This story, "Microsoft Security Essentials: Never Pay For Anti-Virus Again" was originally published by Network World.